The monastery consisted of over six thousand apartments created as protection from Mongols into the hidden thirteen floors high complex. The city included a church, throne room, and a complex irrigation system watering terraced farmlands. Only access to the complex was through some well hidden tunnels near the Mtkvari river. 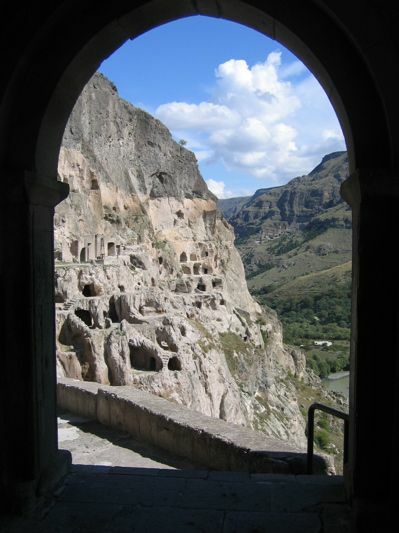 An earthquake in Samtskhe destroyed approximately two thirds of the city in 1283, exposing the caves to outside view and collapsing the irrigation system. The church was reinforced and an externally visible bell tower added during the reign of Bektha Jakheli in the thirteenth century. Thanks to Irakli from Info-Tbilisi for being our guide for this trip, and especially for encouraging us to climb up the “impossible” rabbit holes into the white church of Vani’s caves. And thanks obviously to Taya and Lasha for the whole time in Georgia! The UNDP Samtskhe-Javakheti office was also most helpful.